Call Center Services. Hourly, CPA, & CPL. 100% Satisfaction Guaranteed! Our Call Center Services are unmatched in variety & quality! All of our Call Centers offer a 100% Satisfaction Guarantee! Call Centers For Hire is your all in one stop for guaranteed, quality, call center services. We offer call center services from all around the world. Boasting over 25 services & products across over 75 industries. 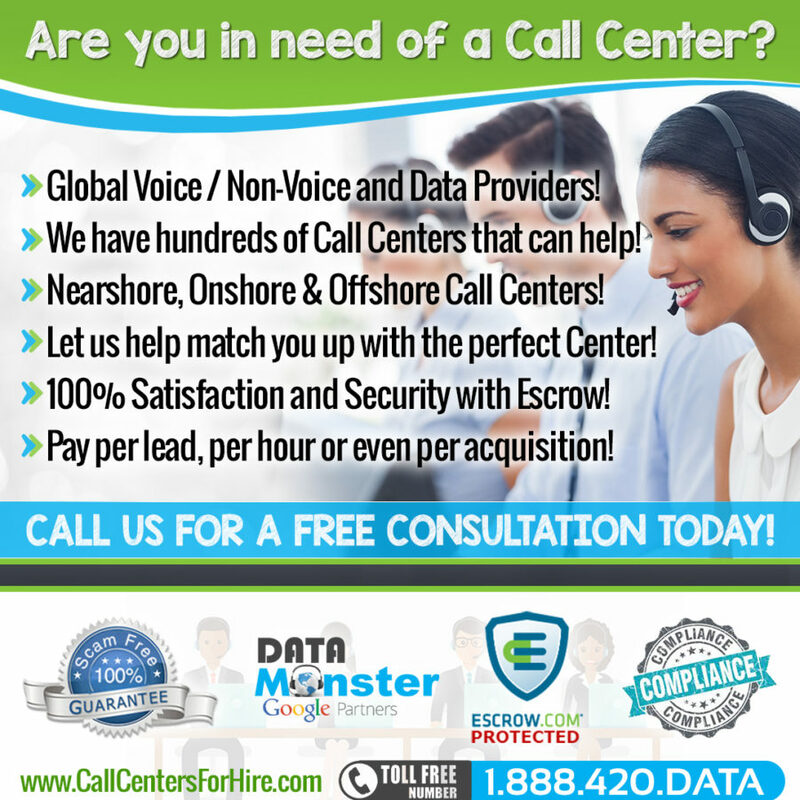 GET CALL CENTER SERVICES FOR LESS! Call Center Services is our passion! With thousands of call center services and even more call centers out there, you just don’t know who to trust. We take all the guess work out for you! We pre-screen and custom match you to the right call center services for you! We have onshore, nearshore and offshore call centers, non voice services, and even work from home agents available to you 24 hours a day 7 days a week! Tell us what call center services your business needs! We are a U.S. based company brokering cloud based call center services and live transfer leads. We cater to almost any industry taking inbound calls or dealing with customers and outbound dialing! From inbound to outbound dialing and live transfer leads, our network of call centers does it all. Our call center affiliates typically offer CRM integration with predictive dialer (call center access), this allows you to track all live transfer or talk time conversions and take your business to the next level! Ask us about our free incentives for all your customers, that is just the icing on the cake! – Live transfer leads and quality GUARANTEED! – “NEVER” get SCAMMED EVER AGAIN! – Personalized Websites with Auto Dialer. After 12 years of impeccable service and our modest Global influence; our true strengths reside in our faith, integrity, lack of greed & our unquestionable grit to unquestionable customer service! 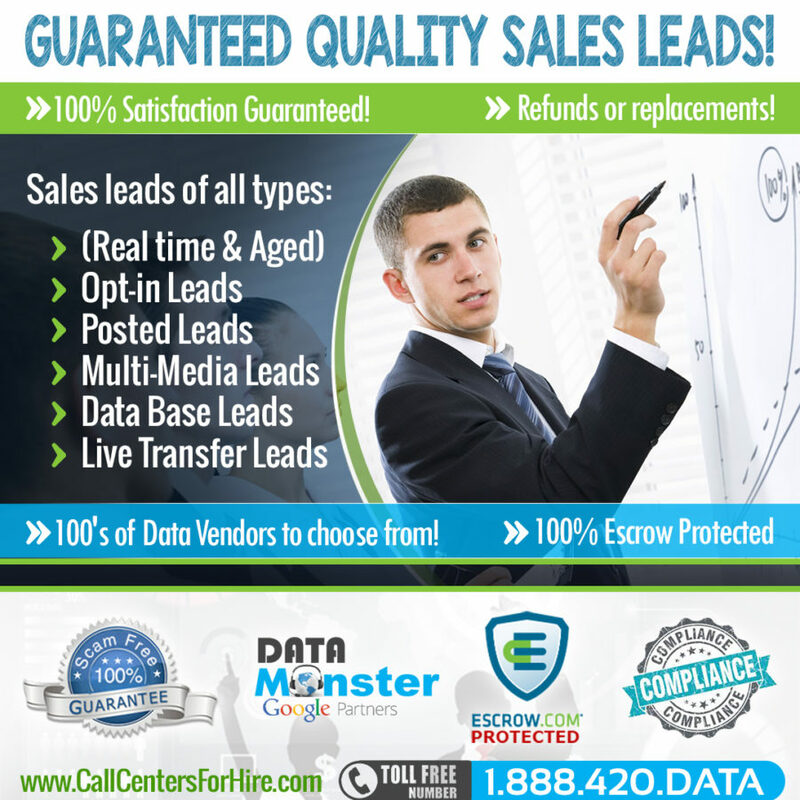 Data Monster researches every vendor on our “Global Marketplace”…. both buyer and seller undergo this process! With our “trench level “research and fail-proof payment methods you can never go wrong with one of our vendors! We utilize only the latest technologies and purest integrity to grow our customers business and their customer base! Let us know exactly what type of Call Center you want. If there are any special notes you can upload them here or leave them in the message box below. Thank you! What price would you like to pay? This is a "Full Time" job. This is a "Part Time" job. This is a "One Time" job. This is a "Seasonal" job. Does the Call Center need to provide their own VOIP (Dialer)? Yes, the call center must have their own data. No, We provide the data. If there is a live transfer involved do you require a buffer?